Other pages devoted to the Devonian, can be found here: 65, 66, 68 & 69. Here is another page of data, that provides such limited data as is at hand about Alfred W. V. Trant, Captain of the Devonian at the time of the Volturno incident. And now Edward Donald Cunningham, Arthur Hazlewood & William Potter also, all members of the Volturno life-saving crew. Hopefully, in the future, more data about Captain Trant & other Devonian crew members may become available to add to these pages. The names are now on the page in alphabetic order by surname. 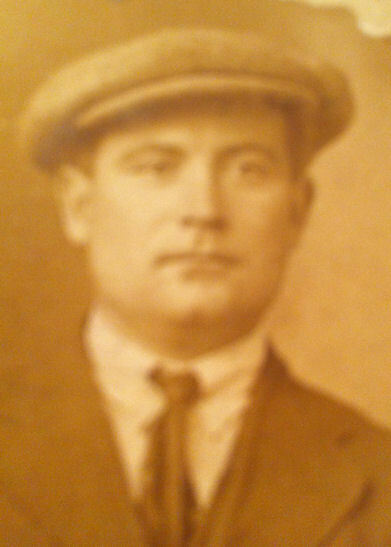 Pauline Campbell has been in touch to advise that Edward Donald Cunningham, one of the decorated crew members of the Devonian boats, was her grandfather. He was, Pauline advises, born in Moka, Mauritius, on Apl. 16, 1879 & came to & settled in Liverpool, where, in 1906, he married Margaret Mary Lambert, a Liverpool girl. Pauline believes that he may be the man third from the left in the left hand photo below & second from the right in the right hand photo, (images repeated from an earlier page) - he then would have been about 34 years of age. Not a lot is known about Edward's career in the Merchant Navy. However he is known to have been an able bodied seaman on Melita, from 1918 thru 1921. He later served on Mercian. He died in 1927, then a quartermaster, of tuberculosis, when Pauline's mother was just 5 years old. Pauline further advises that Edward & Margaret Cunningham had 5 children, four daughters & a son, Pauline's mother being the youngest of the daughters. And also that the Seaman's Orphanage in Liverpool, supported the family after Edward's death. For many years now, I have believed, based upon correspondence from Stan Hazlewood of Leyland, U.K., that Arthur Hazlewood, an able seaman aboard Devonian & a hero of the Volturno rescue, was Stan's grandfather. Stan knew little of his grandfather, who was however known to have been a seaman who sailed the Atlantic on the passenger liners and other ships. What would seem to have happened is that Stan became aware of the involvement of an Arthur Hazlewood in the Volturno rescue, & thought that they had located some long lost family history. It seemed logical to Stan that Arthur Hazlewood, the Devonian hero, must have been his grandfather & that they had found a family 'match'. In Apl. 2012, that conclusion is in major doubt. Sally Montgomery has been in touch, via the guestbook & in e-mail correspondence to advise that there was more than one seaman named Arthur Hazlewood at the time. Maybe many of them in fact. Sally advises that the hero's daughter (I cannot tell you that daughter's name), is still with us & 'holds her late father's memories and memorabilia'. Sally's family would seem to have extensively researched the whole history. And possesses Hazlewood's medals & certificates, photographs, & more general documentation including, most probably, contemporary newspaper cuttings etc. As site readers will be aware, the webmaster likes to present as much data as is available about each person involved in the Volturno story. Lower on this page, as an example, re William Potter, also of Devonian, you can see a photograph of one of Potter's medals, the actual certificate he was granted by the 'Liverpool Shipwreck and Humane Society', & a modest photograph. Similar data is available on page 66 for other Devonian crew members. I am hopeful that it will be possible, in the future, to provide data of a similar nature re Arthur Hazlewood (1890/1946), father of 3 daughters & 2 sons. But I am unable to do that today. And unable to do so, on May 29, 2012, a month after Sally's guestbook message of Apl. 29, 2012. Sally has indicated i) 'I shall have to get together with all of the other family members and decide what is to be submitted' & ii) 'we do have a wealth of information relating to Arthur Hazlewood but as I have already stated I would not be at liberty to submit that to you or any other researcher at this time. Nor would I consider doing so without the permissions of all concerned'. So there the matter stands. The webmaster is ready to include new data about the Devonian Arthur Hazlewood as & when it is received. Whenever that is. But .... no new data has been received by today, Sep. 03, 2013. I do not consider myself to be, incidentally, a researcher. I just try to report, with accuracy, the relevant facts that come to my attention. i) the Board of Trade Medal for Gallantry in Saving Life at Sea - known as the Sea Gallantry Medal (SGM) - in silver. iv) the Lloyd's Bronze Medal for Saving Life (at Sea). Stan's Arthur Hazlewood, known to his family & friends as Stanley? He was a cook, Sally advises. If it becomes demonstrated that he could not have been the Arthur Hazlewood who served aboard Devonian back in 1913, as would seem to be the case, he need not be referenced at all in these pages. And this section will need to be again redrafted. No reflection whatsoever upon 'Stanley' - just a case of mistaken identity. Now there are a number of accounts of Arthur Hazlewood's heroism in these pages but most would seem to have originated from the very same source. What would be good to achieve would be to identify the child that he rescued, were that to be possible. Recognise, however, that no text I have yet seen provides a name. One of the reports however, (page 08), & only one, says that the mother wanted to kiss Captain Inch in gratitude & he told her to get into the boat to rather kiss the seaman concerned i.e. Hazlewood. Since women & children were rescued from the Volturno first, I think it likely that once in that lifeboat she did not leave it to return to the Volturno. She would have been invited to stay to accompany her child. So, if that logic is correct, we are looking for a mother & child, both rescued by the Devonian. But not a child on its own. I am missing 3 names of the 59 survivors picked up by Devonian. Of the 56 survivors I know about I find there are very few who could have been that mother & child (you can yourselves check all the ages on the Ellis Island manifest pages as I did via page 19 - for Devonian of course). A further thought. The reaction of the mother to me is more likely to have been the reaction of a mother with one child rather than a mother with three children. And if you agree with that brave conclusion, I believe the mother & child to have probably been Marie Frank, a mother aged 25 & her child Anton, a boy of 7. Of Croatian ancestry from Chezko? in Hungary. Who were recorded on their very own Ellis Island manifest page (481) when they later arrived in the U.S. aboard Carmania. But that data seems suspect, the ages and origin, I mean. As you can see on page 21, & the further link there available. Will we ever know for sure? Probably not, but some day more data may just emerge that would decide the matter for sure. I know little, at this moment, about William Potter except that he was a seaman on the Devonian & was decorated for his part in the Volturno rescue effort. He was in the crew of the first life boat (#3 lifeboat) sent by the Devonian to rescue Volturno survivors. That boat battled the high seas for over two hours & rescued one Volturno passenger that had lowered himself down a rope into the water. An attempt to take the boat aboard the Devonian again for relaunch met with disaster & the boat was stove in & swamped. The crew, with great difficulty, were taken aboard in an exhausted state. Hello. I believe William Potter was my grandfather as I remember being told that he was awarded medals for saving life at sea. I was shown a gold watch engraved to this effect. He moved from Liverpool to live in Skerries, County Dublin, Ireland. He married a woman called McGuinness. They had 4 sons and 1 daughter. He lived into his eighties. William Potter was awarded i) the 'Board of Trade Medal for Gallantry in Saving Life at Sea' - known as the Sea Gallantry Medal (SGM). Also ii) the bronze medal of the 'Liverpool Shipwreck and Humane Society' along with a certificate & 'substantial money' & iii) a bronze medal pin & $25 in gold by 'The Life Saving Benevolent Association of New York'. And thanks to a friend of the site, I am able to show you what I believe to be item ii) above (left) and also item iii) (right). On the back of the right medal it reads 'vita felicieus ausis servata' & 'awarded to W. Potter for saving human life in peril' (all in block letters). 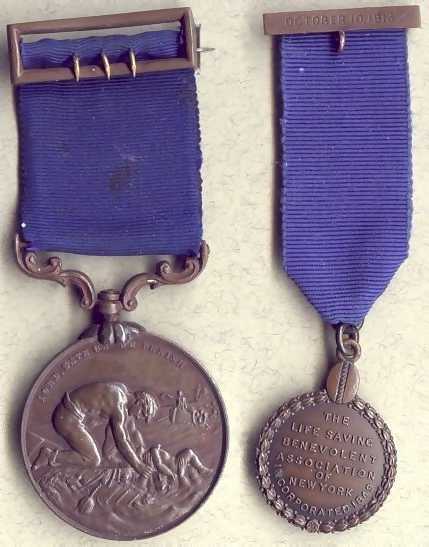 The wording on the left medal reads 'lord, save us we perish' (also all in block letters). And, at right, an undated image of William Potter, kindly provided by Philip Potter, see next paragraph. In Dec. 2011, Philip Potter, William Potter's grandson, contacted the webmaster to advise that William Potter died in his sleep at Skerries, County Dublin, Ireland, on Sep. 15, 1970. 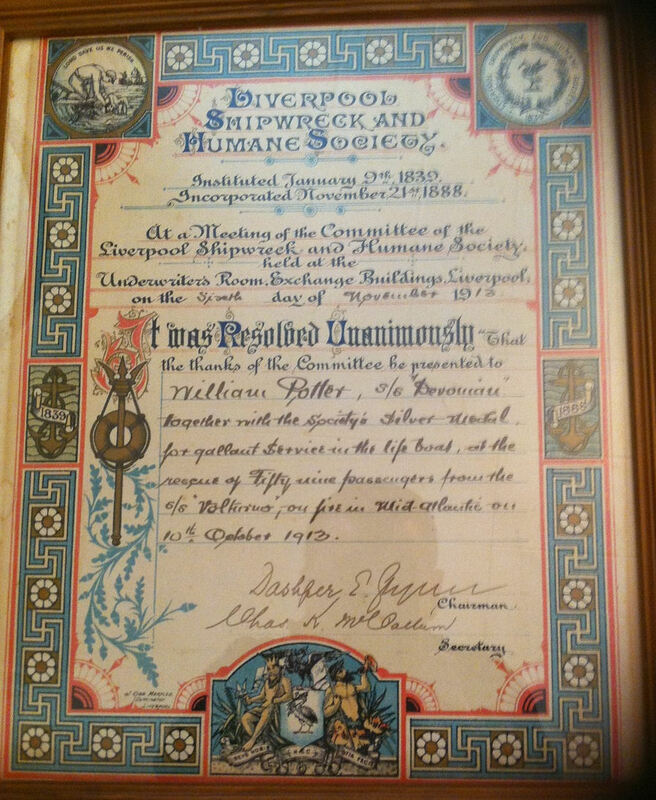 And now, thanks to Philip & to the Potter family, we can show you the actual certificate granted to William Potter by the 'Liverpool Shipwreck and Humane Society', i.e. the certificate that is referred to above. It has been framed all of these years & hung proudly in memory of William's fine effort back in 1913. In Dec. 2014, Martin Potter advised in a guestbook message that William Potter had 5 sons (all deceased) and one daughter, still living. And that Desmond Potter, one of those 5 sons, was Martin's father. 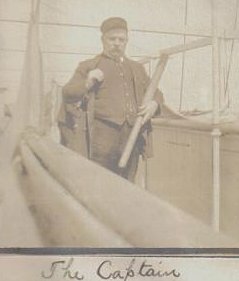 Alfred Trant was the Captain of the Devonian in October 1913. While many of his crew were awarded the 'Board of Trade Medal for Gallantry in Saving Life at Sea' - known as the Sea Gallantry Medal (SGM), Captain Trant seems not to be in the SGM recipient list as I now have it. I understand, however, that SGM awards were not, in fact, awarded to those not directly involved in the rescue in some actual physical way. We now know, however, that he was the Captain of the Devonian as early as May 19, 1906, re a voyage from Liverpool to Boston. Per a passenger list of that trip per Ray Brown. Indeed, at left below, is an image of Captain Trant, taken on that voyage & holding a rather large telescope! We knew he was captain in Jul. 1908 - from this item which can be found lower on the greatships.net Cretic page. 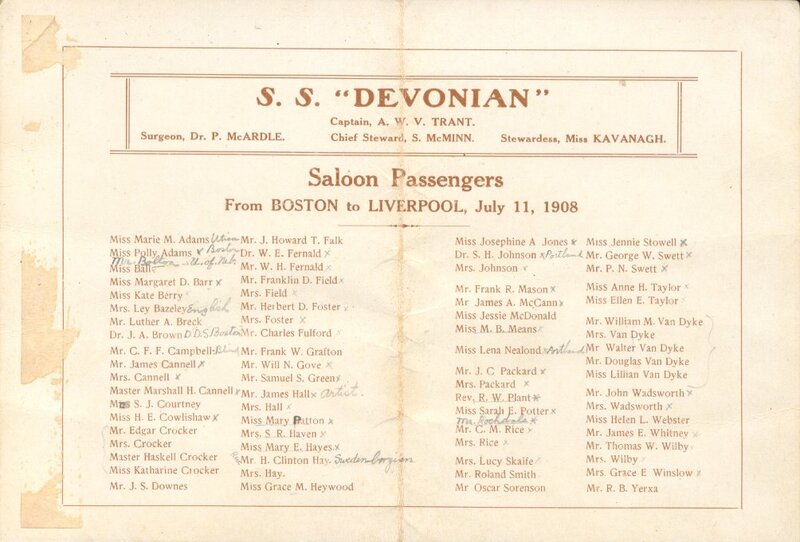 And an e-Bay item in Feb. 2005, a passenger list re the Devonian (with an image of the vessel) for a voyage from Liverpool to Boston on May 1, 1913, listed him again as being the Captain. I am able, thanks to Jon Lawton, to provide a couple of images of the Captain, but not very much else, alas. The Captain is seated in the left image & Ray Brown believes he is clearly the captain by the bars on his sleeves & the gold braiding on his cap. The image may date from a bit later than 1913 with its exact date unknown. I think that 1st Officer Thomas B. Knight is back left in that image. He certainly is with Captain Trant in the right image of the two. Gordon White tells me that Captain Trant was awarded an illuminated address of the 'Liverpool Shipwreck and Humane Society' similar to the one presented to Thomas Knight, (visible elsewhere in these pages), & a gold medal. The 'address' is I understand, in the Merseyside Maritime Museum, in Liverpool. Leyland Line awarded him a solid silver centre piece. An e-Bay item in late Jan. 2007, a passenger list for a voyage of the Winifredian from Boston to Liverpool on Jun. 1, 1922, listed 'ALF. W. V. Trant, O.B.E.' as her captain. So he must have been later decorated with the O.B.E. More, when I have more to provide! If YOU have any new data about Captain Trant, William Potter, Arthur Hazlewood or, indeed, any member of the Volturno or Devonian crews, I would welcome your contacting me. Other pages related to the Devonian are here: 65, 66, 68 & 69.